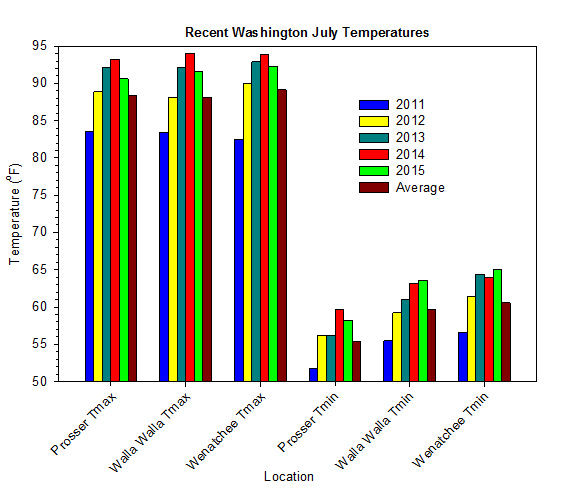 July was another scorching and dry month in Washington, as Mt. Vernon experienced their warmest month on record (mean and high temperature). While areas east of the Cascades were rather hot, at least last month was generally not record-breaking. 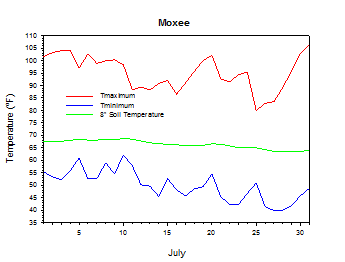 The bulk of the oppressive heat occurred during the first third of the month and again at the end, with somewhat more seasonally hot temperatures for the mid to late July period. Conditions were sunny, sizzling, and dry for the first ten days of the month. 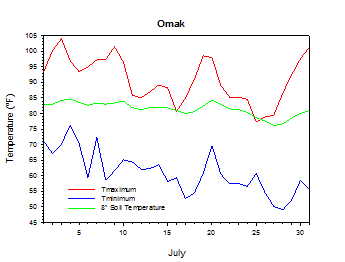 On July 3rd, the high was 109 degrees at Orondo, while the low temperature was 83 degrees at Wahluke Slope. Later, on July 9th, Whitcomb Island concluded a streak of 14 consecutive days above 100 degrees. 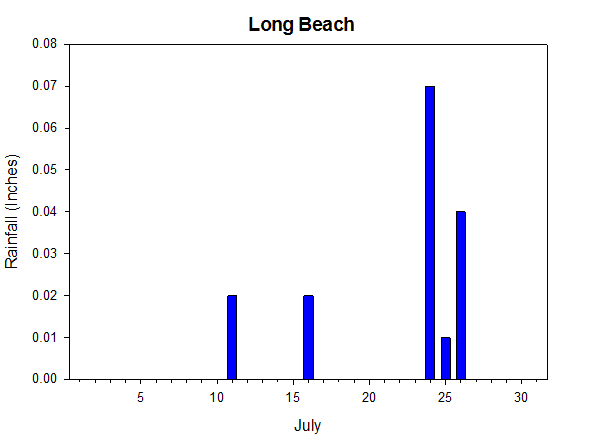 The pattern shifted slightly toward less hot conditions for mid month. Interestingly, 0.83 inches of rain fell at Anatone on the 11th. The end of July was noteworthy for its highly changeable character. Highs on the 19th spiked as high as 105 degrees at Peshastin, before cooling slightly. The weather became quite cool on the 26th, as a storm system passed through Washington. There were clouds, breezes, and even some showers. The high at Pullman was only 66 degrees on the 27th, which was their coolest high since June 3rd, while the low was 39 degrees at Ritzville, which was their coolest since June 13th. The period from July 25th to 27th was particularly surprising given that it was Washington's first stretch, albeit brief, of below normal temperatures in a long while. In fact, January 2nd was the last time that Prosser recorded a day that was as far below normal as was July 26th. Of course, that is more indicative of the warmth of 2015 than of the relative chill of July 26th. Alas, heat returned at month's end, as Benton City climbed to 108 degrees on the 31st. The last rainfall at Prosser was May 26th, which means that the duration of our present dry spell is ten weeks and counting. In fact, conditions were very desert-like at the end of July. 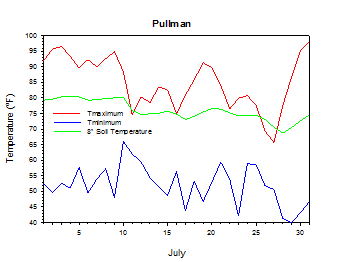 Pullman experienced an unusually large diurnal swing (high minus low temperature) of more than 50 degrees on July 30th. Following a high of just 66 degrees on the 27th, Pullman reached 95 degrees on the 30th, as day-time temperatures warmed nearly 30 degrees in only 3 days. Overall, despite the late month cool spell, July temperatures were well above normal once again. July began with very hot and dry conditions statewide. Many central areas were consistently above 100 degrees during the day, and only in the 70s and 60s at night. On the 9th, Whitcomb Island completed a stretch of 14 consecutive days (dating back to June 26th) of highs above 100 degrees. Mercifully, the incredibly persistent heat of early July subsided briefly around mid month, as highs fell into the 80s and 90s (70s) in the east (west). There were breezy periods, and even isolated rainfall in parts of eastern Washington, including 0.83 inches at Anatone on the 11th. Heat returned late in the period, as Peshastin reached 105 degrees on the 19th. Moderate conditions became quite cool and unsettled on the 25th. Pullman reached only 66 degrees on July 27th, which was their coolest high temperature since June 3rd, while Ritzville fell to 39 degrees, and the wind at Lind gusted to 34 mph. However, a strong warming and drying trend sent temperatures soaring to 101 degrees at Vancouver on July 30th. 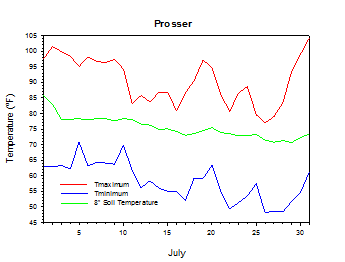 The average July temperature at Prosser (WSU IAREC) was 75.2°F, which is 2.5 degrees above average. The average high temperature was 90.6°F, which is 2.2 degrees above average. The average low temperature was 58.2°F, which is 2.8 degrees (1.1 standard deviations) above average. The maximum temperature recorded last month was 104.3°F on July 31st, while the coolest daily high was 77.0°F on July 26th. 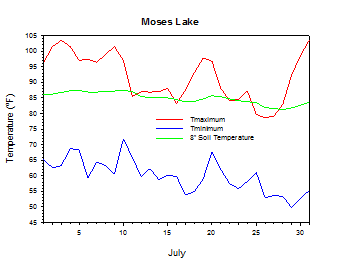 Low temperatures ranged from 70.8°F on July 5th to 48.2°F on July 26th. Daily average temperatures ranged from 83.7°F on the 2nd to 64.2°F on the 26th. The monthly precipitation total was 0.00 inches. 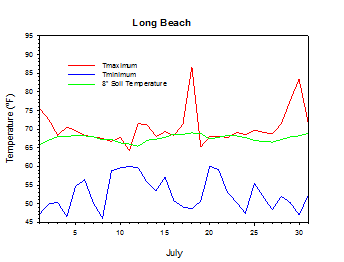 The average wind speed was 4.1 mph, and the average 8 inch soil temperature was 75.6°F. 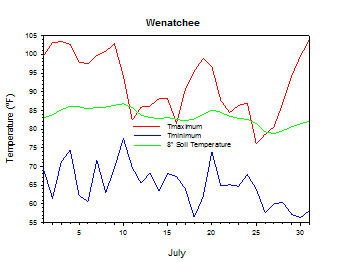 Wenatchee (WSU TFREC) recorded an average temperature of 79.2°F, which is 3.6 degrees above average, while Walla Walla's average monthly temperature of 77.7°F was 3.4 degrees above average. Pullman was one of the cooler spots in eastern Washington, with an average July temperature of 69.9°F. In western Washington, Mt. 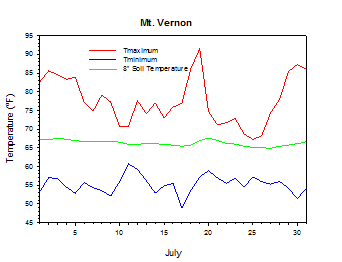 Vernon's average temperature was 65.9°F, which is 3.7 degrees above average. 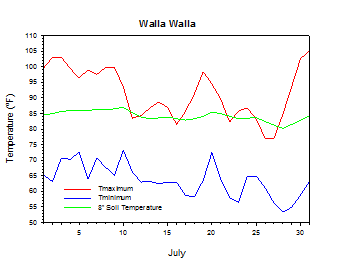 July 3rd: The low temperature at Wahluke Slope was a sultry 83 degrees. July 3rd: The high temperature at Orondo was a scorching 109 degrees. July 11th: 0.83 inches of rain fell at Anatone. July 24th: 0.6 inches of rain fell at Nooksack. July 26th: 0.43 inches of rain fell at Woodinville. July 27th: The high temperature at Pullman was only 66 degrees. July 27th: The low temperature at Ritzville was just 39 degrees. July 31st: The high temperature at Benton City was 108 degrees. Heat and water stress continued to cause problems for Washington growers in July. As of July 12th, blueberry harvest was in full swing, and pumpkins were in full bloom. Peach harvest began while apricot harvest waned. Junior water rights producers in Yakima County reported crop loss. Winter wheat harvest was underway, and below normal yields were expected. As of July 26th, grass seed harvest was complete, and spinach harvest was expected to begin shortly. Plums and peaches became ripe in late July, and apples were sizing well. Recent heat caused sunburn damage on some grapes, and peaches were sprayed for powdery mildew prevention. Hops were in bloom, as Bartlett pear harvest neared. Some junior water rights holders had their water closed down (National Agricultural Statistics Service). 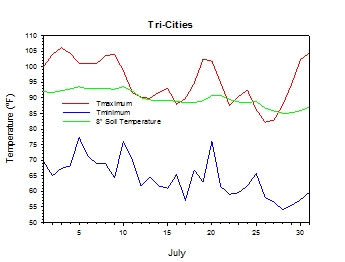 On July 23, 2006, the temperature at WSU Tri-Cities soared to 110 degrees. According to the Climate Prediction Center, above normal temperatures and below normal precipitation are very likely for the remainder of 2015 and well into 2016. Moderate to strong El Niño conditions continue, and a strong event is expected to peak during the late autumn or early winter.